Rocky Hill, CT - Nutmeg State Financial Credit Union is celebrating the Grand Opening of its newest location in the Stratford ShopRite, 250 Barnum Avenue Cutoff. This is the credit union’s ninth branch, and the only location in Fairfield County. The doors opened Monday, December 4, 2017 to new and existing members in the community. At the end of 2016, Nutmeg merged with Housatonic Teachers Financial Credit Union in Stratford. This location replaces the old Housatonic office located in their Main Street office. 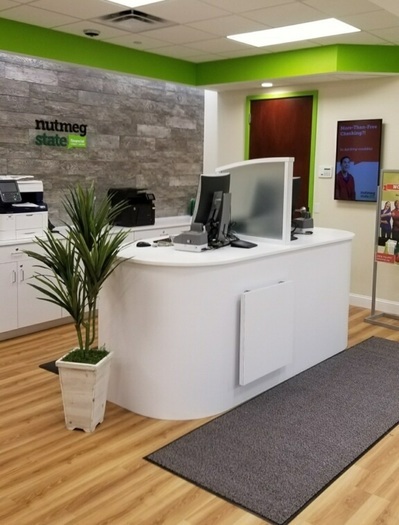 All Housatonic members have transitioned to Nutmeg members, and the staff in this location will continue to promote the Credit Union’s products and services to all those in the community. Nutmeg remains committed to staying on top of industry and technological trends. Complete with iPad and tablet kiosks, the helpful staff will be available to educate members on Nutmeg’s banking technology. These services include their website, online e-Banking and mobile app. These digital platforms allow members to open accounts, apply for loans, deposit checks, pay bills, check balances and more. Nutmeg continues to bring these e-Services to all members, 24/7 online and through app-enabled devices. “We are excited to continue growing within state. Even with all our technology, we recognize the need for physical, brick-and-mortar locations. We are happy to bring this Stratford location to our members from Housatonic Teachers as everyone in the community,” says John Holt, President & CEO of Nutmeg. Special Grand Opening promotions will be available, exclusive to the Stratford location. The official ribbon cutting ceremony for this location will be announced soon.